Dr. Jerold Guss and Dr. Carmen Rahimi offer dental implant placement and restoration at their Simi Valley dental office. Our experienced Simi Valley implant dentists provide their patients with the most advanced technology and long-term health benefits available when replacing missing teeth. For many reasons dental implants are widely regarded as the best option for tooth replacement. Implants are sustainable and will stimulate bone growth while supporting the proper alignment of your bite. The teeth in your mouth act as place-holders. When one or a few are missing, the alignment of the rest may become compromised, sinking inwards towards the site of the missing tooth or teeth. Dentures and bridges can adequately replace a missing tooth, but they don’t replace the tooth root. The jaw remains vulnerable to deterioration and this can negatively affect personal appearance, giving the face a slack, aged and drooping look. Implants, by contrast, stimulate the jaw bone, offering a comprehensive restoration, one that replicates both the root structure as well the crown. 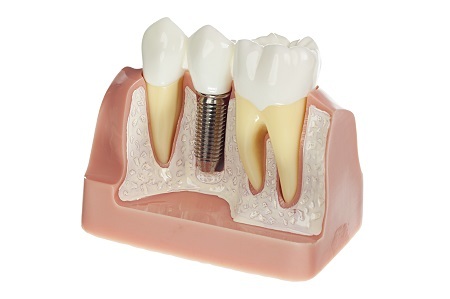 There are three key components to a dental implant, the implant itself which is crafted out of titanium and placed in the jawbone, and then an abutment which connect the prosthetic crown, bridge or denture to the implant itself. Most dental practices are prepared to restore the crown, bridge or denture but are not equipped to place the implants themselves. At our Simi Valley dental practice, we are qualified to provide complete dental implant service. In all but the most unusual of cases, we will be able to place the implant as well the surface restoration. After dental implants are placed they are given time to heal. During this time temporary crowns or dentures are used by the patient. It takes approximately three to six months for the implants to settle and fuse permanently to the bone. Once the implants have stabilized, patients return to our office to receive their permanent, life-like crowns, bridges or dentures. In certain circumstances there may not be enough bone tissue available to support implants. In these cases, bone grafting procedures can be used to improve bone density and facilitate placement. Whether a patient receives crowns, bridges or dentures depends on the extent of the tooth loss. A series of (usually four) implants can be used to support a full denture. Your Simi Valley implant dentists are happy to answer any questions you may have about the options, procedures, costs, and timelines associated with dental implants. Set up an appointment time online today. Or feel free to contact us by phone or email.